Where to find hope when the world throws you for a loop? Today, I am headed with one of my kids to the hospital emerge for a minor but very necessary semi emergency surgery. It is not my first run to the emergency room, but this time I am better prepared. How can I stay calm when my baby is headed under an aesthetic & the scalpel? I have a choice over how I handle things, regardless of the situations or outcomes in every storm that picks up speed and rages with the intent to pull me under. The more you have vested in what the storm is threatening, the more fear will swirl about you. Where do you find hope when the water is headed over your head? 1. Look up. Make eye contact with the Father. 2. Listen for His echoes of hope, eternally sounding for all to hear. 3. Let loose with your need. Open your mouth, and cry out for His intervention. 4. Leave it with Him. These are the four steps to claiming the peace God has for you, and experiencing Him as your hope, no matter what. When we reach for stability when we can’t feel the bottom, God is there to anchor us. When our hearts feel like they will break in two, God will keep you close. When the words fail to make it to your voice, God hears the cry deep within. When all else fails, God never has, and never will. How do you walk out finding hope in His Presence? It is not easy to do, especially with the sudden shocks we can find ourselves faced with. I so get that. I can only tell you that when loved ones have died, God was there for me. When health caused unexpected losses in income, God provided. When loneliness threatened to pull me under, God drew close. When pain screams loudly for my attention, God soothes my soul. Wow, this is a powerful post. Your point 1 is so true – our first step has to be to stop and look up. I find using the verse from Psalm 46 ‘Be still and know that I am God’ helps me to slow enough to find him again amongst the crowd of worry and rush. And your ending, a good reminder to journal God’s faithfulness as a future rock for ourselves to lean on. Praying that you keep hold of God’s peace today, and that all goes well. Thank you for the encouragement. I find the Psalms a great comfort at reminding me it’s okay to be honest & myself before God, that His love & faithfulness will never end! 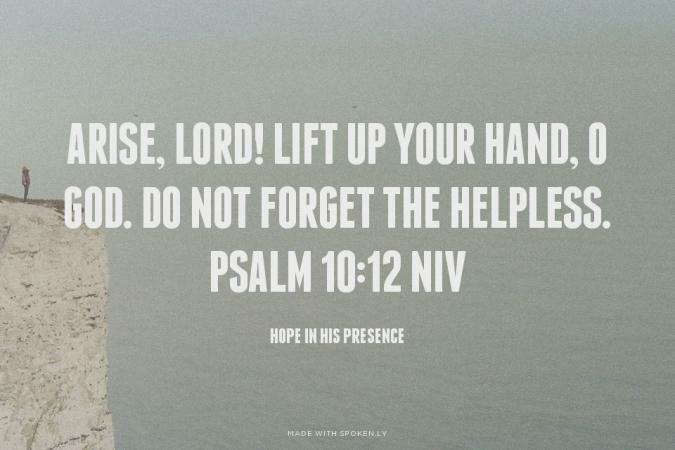 Holding on to His hand & my Hope! I love this! And I love that you make it personal. Instead of telling us to ‘pray,’ you tell us to look up and make eye contact with the Father. I love that visual! So very true. Thank you for reminding us that we must look to the father and release those things to him. You are most welcome, Dianna! Standing on his comfort today. Your words matter and I am so glad I stumbled upon them.